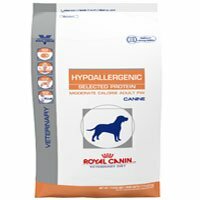 Is Royal Canin the best brand for my little puppy or grown dog? What’s so special about Royal Canin? Why the Royal Canin dog food reviews and Royal Canin puppy food reviews? Aren’t all animal by-products bad? Can I feed my puppy any of the foods in your Royal Canin puppy food reviews? Vet-established Royal Canin make what’s probably THE most popular dog foods and puppy foods we’ve ever had the chance to review. In fact, they turn 50 years old this year! Royal Canin make a seriously wide range of dog foods, puppy foods, and even treats that are nutritionally formulated for all kinds of breeds. Most importantly for us, they’re super-serious about their reputation and when you choose a reputable brand, you’re always guaranteed to be feeding your loving pet recipes that have been certified, regulated, and approved by the AACFO. In a nutshell, that means quality. Top quality, to be precise! Not only were Royal Canin founded by a vet way back in 1968- Dr. Cathary, to be specific- the company has their own dedicated team of scientists who are responsible for developing nutritious and highly balanced recipes for your pooch. The U.S. headquarters of their international firm is in Missouri, where they also manufacture. Another thing to note about Royal Canin is that because they make food that’s based on research and scientific evidence, they collaborate constantly with other dog experts like breeders and vets. Besides the fact that they craft specific foods for a large number of varying breeds, Royal Canin also develops dog food and puppy food that’s targeted at the precise needs of pure breed dogs and puppies. German Shepherds, Yorkies, Labradors, Rottweilers, Pugs, Boxers, Golden Retrievers, and the list goes on. In fact, in most cases they offer tailored food for each of these breeds, that’s also available in puppy and adult varieties. Not bad, hey? Rigorous standards that they apply to each and every ingredient supplier, as well as stringent tests for quality. Real potato does the trick of replacing the more common grains in this adult dog food. In fact, it’s also a source of natural protein! No rice, no wheat, no corn, no soy, no worries for you owners with dogs who need to remain gluten-free! LOADS of those trace minerals we know are super important for doggy health, think zinc, think iron, think manganese, and copper… you get the idea! Fat’s super low at only 7.5%, because this recipe’s especially for dogs who are in need of dropping a little weight. Not so many cons, really, this is not only free from all grains but also a pretty darn good candidate for a hypoallergenic dog food! 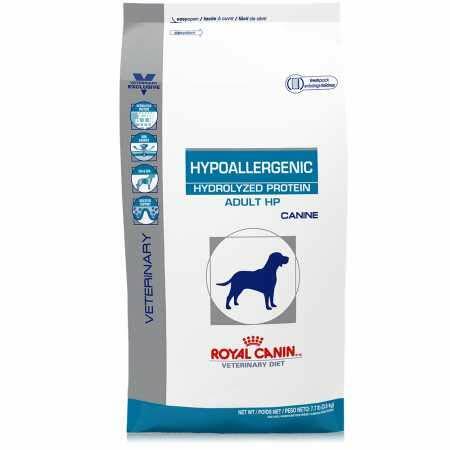 Royal Canin Selected Protein PW has definitely got a whole bunch of useful, healthy, and all-around great vitamins alongside those minerals that are so integral to the well-being of your adult pooch. 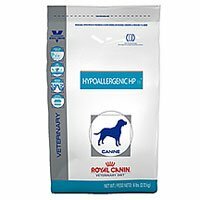 Royal Canin Medium Puppy Dry Dog Food, 30 Lb. Attention, Husky, Border Collie, or Basset Hound owners, and of all you with beautiful mid-sized pooch puppies! Here’s one of the most popular puppy foods we’ve ever come across, and it sure as heck is popular for good reason. Calcium for awesomely strong bones! Contains milled chicken by-product, although in this instance it’s part of an AAFCO certified balanced and wholesome diet. 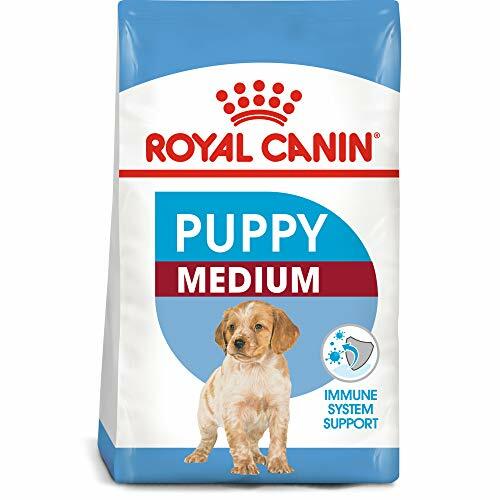 Royal Canin Medium puppy food’s suitable for medium puppy sizes, and we’re suitably impressed! We’re particularly liking the high protein and fat levels that are so crucial for giving your puppy their necessary daily energy. So, if you’ve got a Yorkshire Terrier, Pekingese, Chihuahua, or Cavalier King Charles Spaniel, you’ll most likely be aware of the fact that these (very!) little puppies do grow quite rapidly. So, they’ll definitely have a higher need for energy to sustain their quick growth, which is what this Mini Puppy food offers. It’s very clear where most of the 18% fat comes from, which is excellent- it’s chicken! Contains naturally-sourced DHA, aka fish oil! Not suitable for those little puppies with insensitivities to gluten, especially corn. Every time a puppy food brand develops specifically formulated food that takes into account both breed and life stage, they get a big tick in our books. This Mini Puppy food’s also got fish oil, so it’s playing a role in maintaining and improving both your puppy’s vision and his brain function! Large puppy breed owners, we definitely haven’t forgotten you! This Maxi puppy food is specifically formulated for bigger breeds including Pit Bulls, Dobermans, Collies, and Irish Setters. Awesome amounts of both chondroitin, as well as glucosamine, meaning your large puppy’s joints are well taken care of! The top ingredient’s corn rather than a natural meat. As our special Pit Bull article mentions, glucosamine acts in conjunction with chondroitin to play a super-important role in ensuring your little puppy can have healthy and well-functioning joints. Also, the protein levels and fat levels are just great for making sure growth and weight factors are well balanced. Here’s another amazing wet puppy food that’s for smaller puppy breeds, or even for those that are only going to be growing for close to ten months before they’re all done. And once again, it’s been given a big tick from the AAFCO as a puppy food that’s holistic and also balanced. It’s only got only 166 calories in each can, so it’s lower than a lot of other canned puppy foods. Not gluten-free, unfortunately, though this shouldn’t be a problem whatsoever for most puppies. This relatively low-calorie, small-serve wet puppy food seems like it’s designed especially for giving your growing little one a treat. 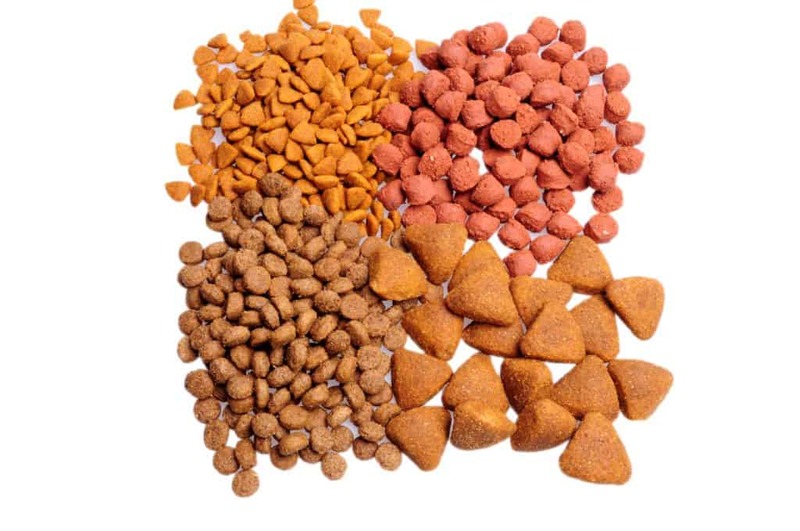 It’s perfect for mixing in with dry kibble for a nice change from either one or the other, and also it’s incredibly popular with puppy owners who say their pup just adores it. Intolerances, allergies, bowel problems, weight management, and a whole host of other things are considered in this recipe for those adult dogs who have special hypoallergenic dietary requirements. Removing phosphorus entirely from dog food isn’t sensible, nor is it possible in many instances because meat is so rich in the mineral. The use of soy protein here cuts down this level, though, so it’s at an ideal level with regard to pooches with kidney problems. See? Scientifically formulated! EPA’s in this hydrolyzed protein dog food, alongside DHA. It’s not designed for dogs who can’t tolerate specific grains, i.e. it’s made using rice. Hydrolyzed protein simply refers to a protein that is more easily digestible for your puppy or dog, and this is ‘cause it’s broken into smaller sized molecules. This makes it pretty great for those dogs and puppies who have allergies. Suitable for feeding all kinds of dog sizes from 4 pounds to 180 pounds, as well as puppies! Have you got a Dalmatian? If you do, you’ll know that they can quite easily develop bladder stones. Hydrolyzed protein is super for these dogs especially, as well as more generally for our canine friends who sometimes have trouble digesting with ease. The reason so many lower quality and less reputable brands are often found using certain animal by-products is because, quite frequently, these ingredients are a cheap way to bulk up dog foods and puppy foods so that they’re economical to manufacture. Royal Canin are not a low-quality brand, and their use of by-products is actually quite carefully justified by their scientists in terms of the role it plays in providing your puppy or dog’s food with balanced nutrition. In simpler terms and first up, by-products often pack a real protein punch, that’s why their use is deemed justified by the scientists making Royal Canin. Secondly, the brand is much more selective in their use of specific by-products than less reputable brands. This means that rather than adopting an ‘anything goes’ philosophy – think beaks, cartilage, and so forth – Royal Canin only use higher quality varieties of by-product, such as animal livers and lungs. We sometimes recommend that puppies be fed puppy food that’s specifically created with their breed in mind. 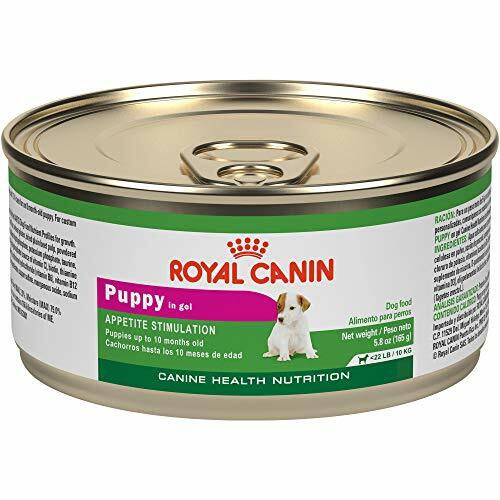 Because this food’s been scientifically developed, it’s a good way of ensuring that your little puppy is getting the requisite nutrients for great health and, of course, growth. 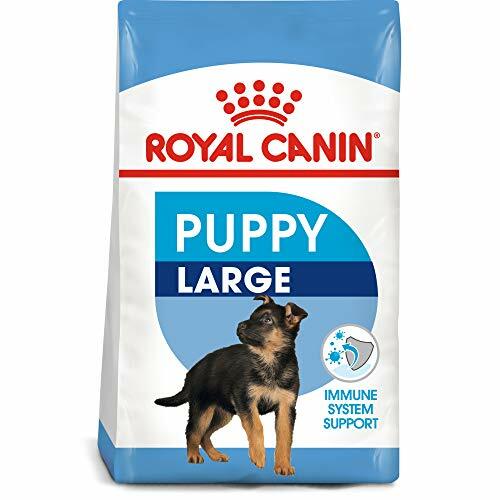 As you can see from our Royal Canin puppy food reviews, the brand makes some exemplary recipes that carefully integrate the necessary nutrients for large (maxi), medium, and small (mini) breeds. Not only this, but they are well aware that differently sized pups have distinct growth periods- smaller puppies for around 10 months or so, larger puppies for longer. 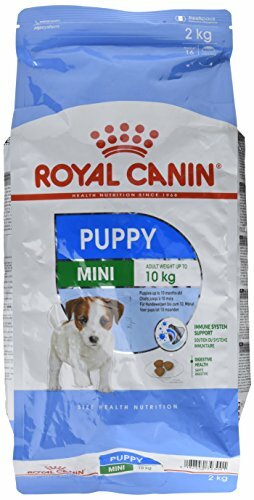 So, unique energy content, macronutrient profiles, and kibble design considerations mean there will most likely be a specific kind of puppy food in our Royal Canin puppy food reviews that’s best for your little buddy. I have two Jack Russell puppies, one is almost two and the other is 18 months. What would be the best dry food to have them on? The almost two has seasonal allergies and digs at her paws pretty much most of the time. I think I need to be concerned with what she is eating. They are both eating dry food now but the kibble has to be small or they are not happy with it. I would appreciate any feed back, they currently are eating Purina Incredibites. hello, Nancy! you can try Royal Canin Breed Health Nutrition Jack Russell Terrier Puppy dry dog food. We think your puppies will like it and will be totally happy with the kibble It is designed to be easy for the Jack Russell Terrier to pick up and encourages chewing.